Surface resistivity measurement provides extremely useful information about the state of a concrete structure. Not only has it been proven to be directly linked to the likelihood of corrosion and the corrosion rate, recent studies have shown that there is a direct correlation between resistivity and chloride diffusion rate. ResiPod is a fully integrated 4-point Wenner probe, designed to perform concrete resistivity measurement in a completely non-destructive test. It is the most accurate instrument available, extremely fast and stable and packaged in a robust, waterproof housing designed to operate in a demanding site environment. Resistivity is one of the key controlling factors once corrosion begins. Corrosion requires a flow of ions between anodic and cathodic sites on the reinforcement of concrete; the resistivity controls the rate of this flow of ions and therefore directly controls the rate of concrete corrosion. What this means is that by measuring concrete resistivity it is possible to determine if a structure that is corroding and will deteriorate quickly or if the corrosion rate is slow and can be addressed in a more conservative manner. This can be a very useful test in combination with Half-Cell potential measurement to locate hot spots for corrosion likelihood. 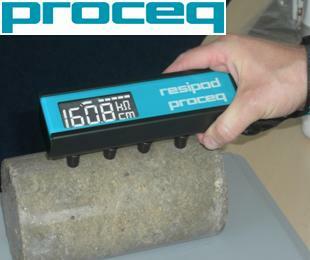 The Surface Resistivity (SR) test is a much quicker and easier test for estimating concrete permeability. The traditional testing method, Rapid Chloride Penetration was laboratory based and very labour intensive, taking 4 days of preparation and testing including cutting, epoxying, desiccation and testing. 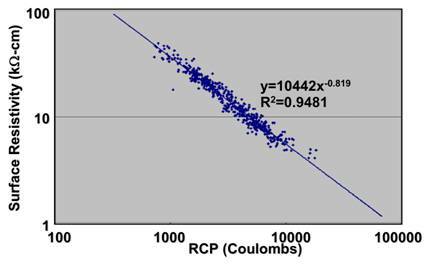 A study initiated in 2002 by the Florida Department of transport has determined a strong correlation between Rapid Chloride Penetration [RCP] measurements and resistivity measurements (see image below). This discovery now means permeability testing can now be done in 10 minutes instead of 10 days using the same cylinders or cores used to determine compressive strength. Operating on the principle of the Wenner probe, the ResiPod is designed as a resistivity meter to measure the electrical resistivity of concrete or rock. A current is applied to the two outer probes, and the potential difference is measured between the two inner probes. The current is carried by ions in the pore liquid. The calculated resistivity depends on the spacing of the probes. When taking measurements the unit automatically changes its measurement methods to suit the subjects. Normally it will attempt to drive a full 200uA current through the concrete, if this is not possible due to a high resistance it will drive 50 uA and if that is not possible due to a very high resistance the device will instead drive a voltage across the outside probes and measure the induced current to obtain a resistivity estimate. This allows the Resipod to measure much higher resistivity’s than a basic Wenner Probe. 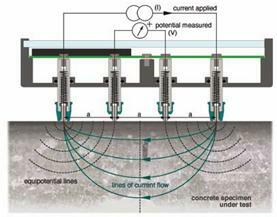 Wider probe spacings provide a more consistent reading when measuring on an inhomogeneous material like concrete. However, if the spacing is too wide, there is more danger of the measurement being affected by the reinforcement steel. 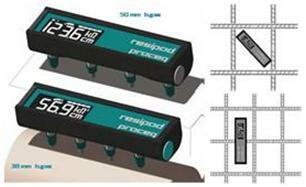 The industry standard 50 mm probe spacing has long been seen as a good compromise. The 38mm model is designed specifically to comply with the AASHTO standard (under development) for “Surface Resistivity Indication of Concrete’s Ability to Resist Chloride Ion Penetration”. 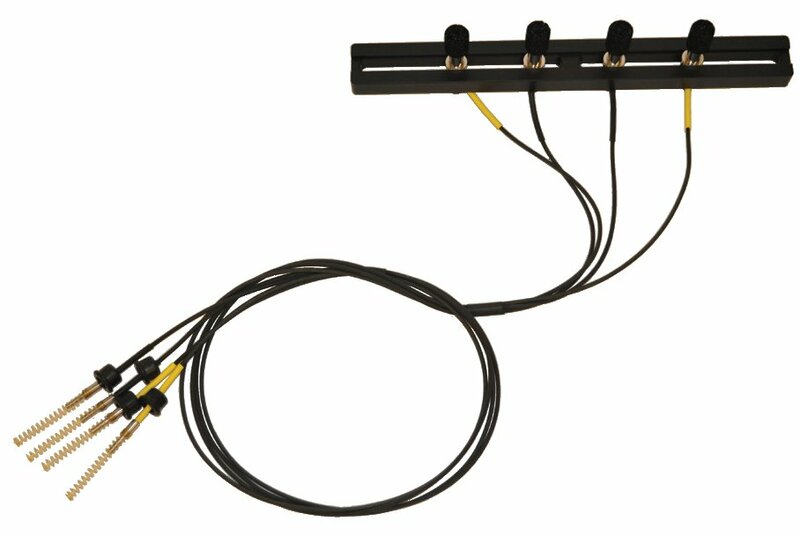 The contact extension cable kit can also be used to attain variable spacing for the contacts. Spacing from 20-85mm can be achieved using the kit, which is bought as an optional accessory. 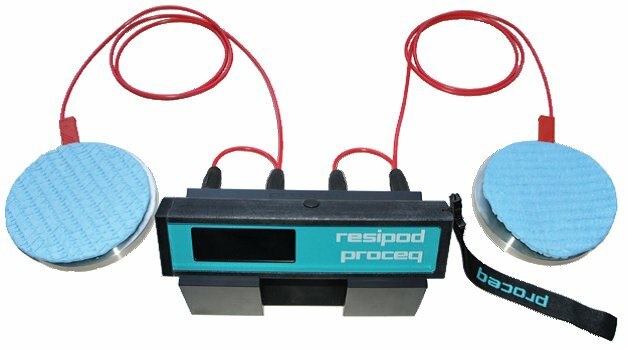 Despite being extremely simple to use, ResiPod provides a variety of features that are unique in a concrete surface resistivity instrument. The display of the ResiPod shows all necessary information while acquiring data on site. A good connection between the instrument and the concrete surface is the most important factor for obtaining a reliable measurement. ResiPod automatically detects a poor connection and alerts the user. 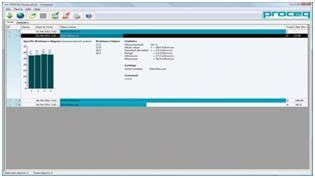 The collected measurement values can then be analysed comfortably with the ResiPod Link PC tool. System requirements: Windows XP, Windows Vista, Windows 7, USB-Connector. An internet connection is necessary for soft- and firmware (using Pq Upgrade) updates if available. The ResiPod can now be upgraded to take bulk resistivity of 102 x 204 mm cylinders using the Bulk Resistivity Module. Bulk Resistivity measurements are taken in such a way that the whole of the cylinder informs the result and are able to be correlated to surface resistivity measurements. The module includes 2 metal and sponge contacts and a convenient stand for the ResiPod.